Recordings tested with over 5,000 live performances! Special discount if you buy the entire series in any format! Now you have a perfect audio and/or video collection, designed to incorporate various holidays and inspiring/uplifting themes. You won't have to go searching anymore for material to show or play that fits the themes and holidays of each month. Just download this series onto a cd or dvd, then play it for (or show it to) your elders! 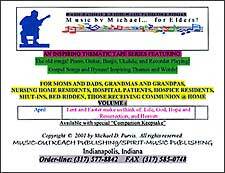 And, best of all, these recordings feature all the songs elders know and love played on a variety of instruments, sung beautifully, and presented by Michael with warmth and charm. The best of both worlds, Music-Outreach Thematic Recordings have a short themed opening section, plus finish with an excellent, varied singalong you can use over & over, all year round! Drawn from Michael's over 5,000 live performances, these programs are tested and a sure success! See if your residents don't tell you that the songs in these recordings are the one's they use to sing with their mothers while they scrubbed the floor or did dishes together, or enjoyed with their families in the evenings. Each recording features Michael's beautiful singing voice, plus accompaniment on many instruments, including: digital piano on various settings, several different types of guitars, banjo, and recorders. As always, Michael draws his audience in with his warm presentation. Your residents will feel as though they have made a new music friend, and want to hear from Michael each time you play a Music-Outreach Thematic Cassette, CD, or video! Order All Twelve Volumes and receive 20% off!